There are so many wonderful images presented by Karen Longwell, it is really difficult to choose! 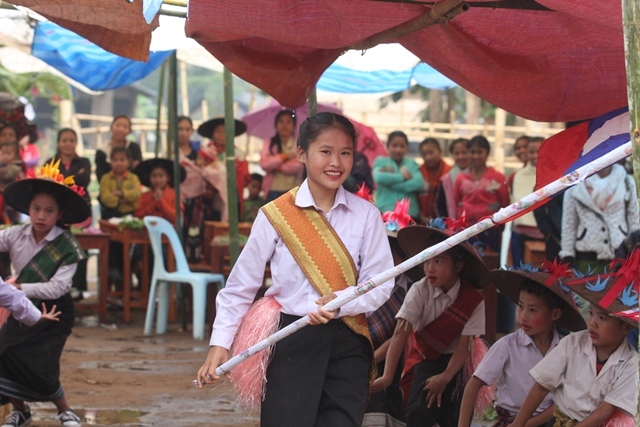 Let’s start with the performers who waited so patiently for us to complete the formal part of the ceremony and to get the sound system going. 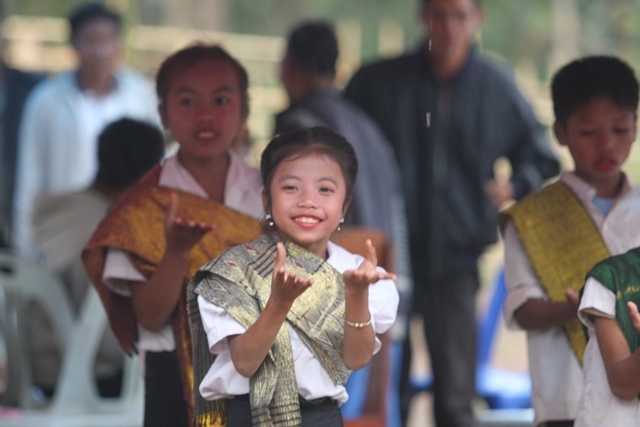 None of this would have been possible without the generous support of Jai Lao Foundation for the construction of the school. 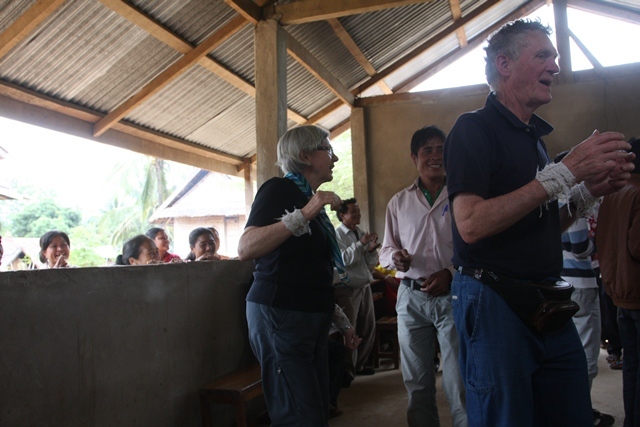 Two villages participated in this presentation – note in behind us all are the new toilets, thanks to the Rotary Club of Whitby Sunrise. Stand Up Linda, we can’t see you! 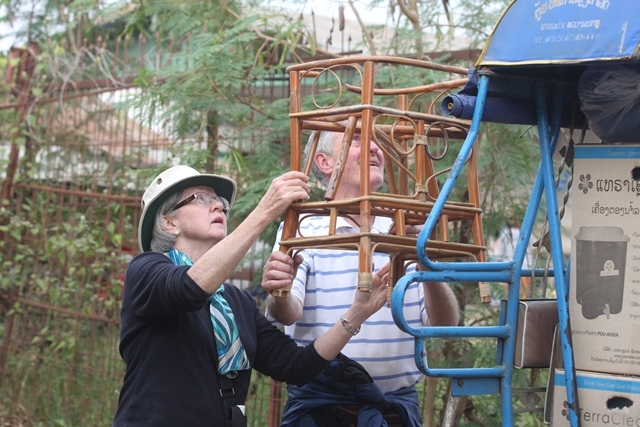 Now it is our turn – although not quite as glamorous. With the end of the ceremony, out day was by no means finished. 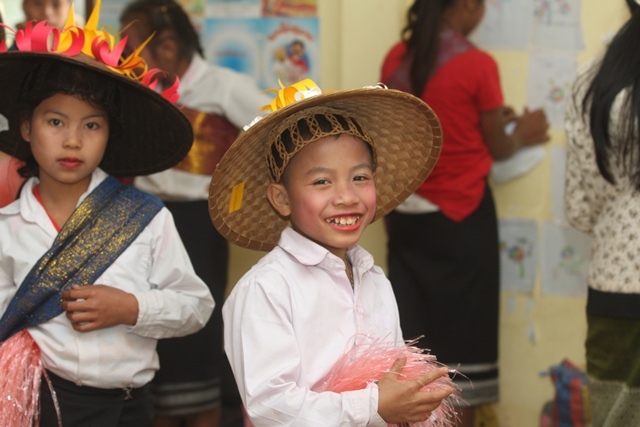 Hat Kham had grown by a few families since last year AND informed us that there would be another 23 new kids going to school next year, with only 5 kids graduating grade 5 (thereby leaving public school). It disturbs me to know that out of an average class size of 20-25 students at the start, that only 5 kids make it through public school. I wonder how many, if any will make it to secondary school. 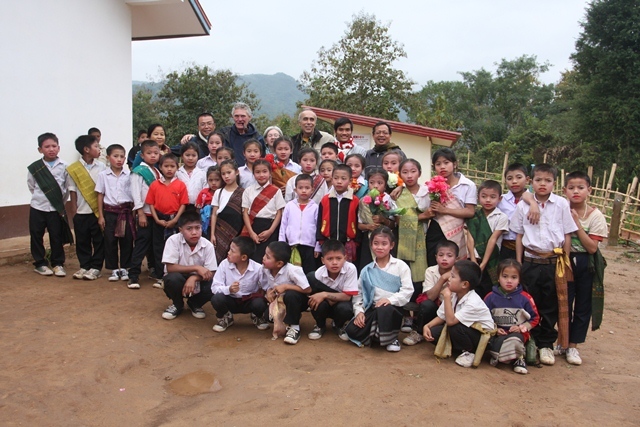 Note that 17 of the children here are sponsored by our generous donors. So onto our next phase. 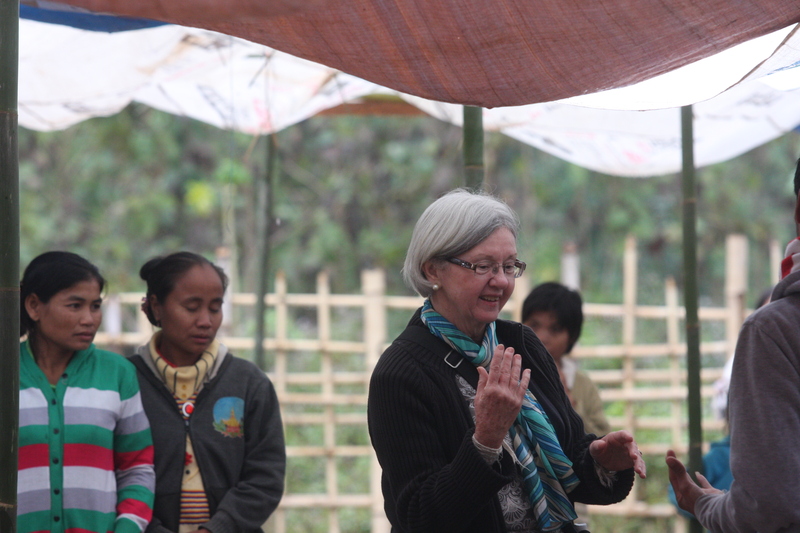 We still had to teach hygiene to the new families and distribute a few more water filter systems. I tried a new trick this time. It is customary to wash your hands before dinner, right? It is for the villagers too. However whoever eats together, washes their hands in about 4 inches of water in a bucket, then dries them on a dirty towel – yes everyone shares the same bucket. 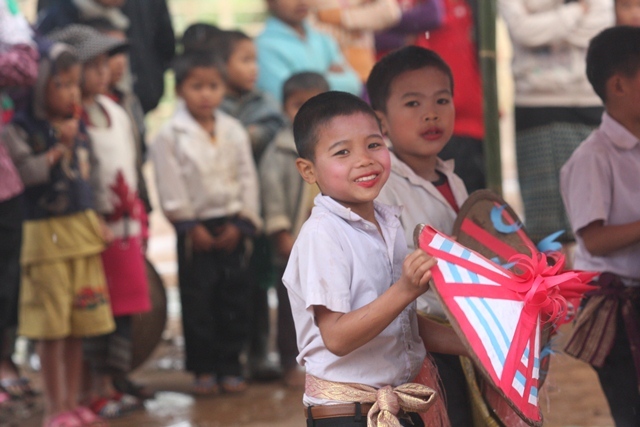 So this time I brought some blue sparkles from home, sprinkled some in the bucket and on the hands of a couple of villagers – they were then asked to wash it off in the bucket and dry their hands (along with other villagers who did not get the sparkle treatment. Guess what, blue sparkles were everywhere. Once I explained that they should imagine the blue sparkle to be bacteria causing sickness, it was like a light bulb went on in their heads. That was really cool. 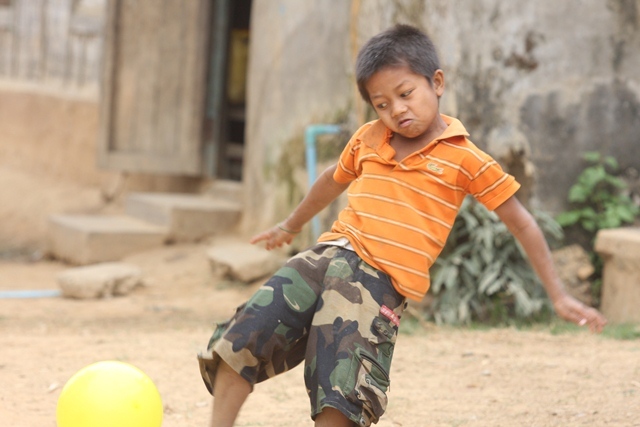 We saw this kid on the way out of the village – I don’t know whether it is sheer concentration or he is very upset at something….what a shot Karen! 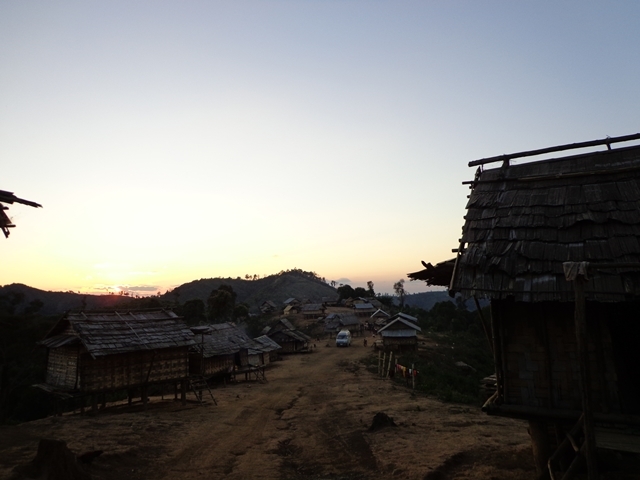 So finally we were off to the village of Muang Ngoi to get some rest after a lot of Lao Lao (rice whiskey) and beer Lao. 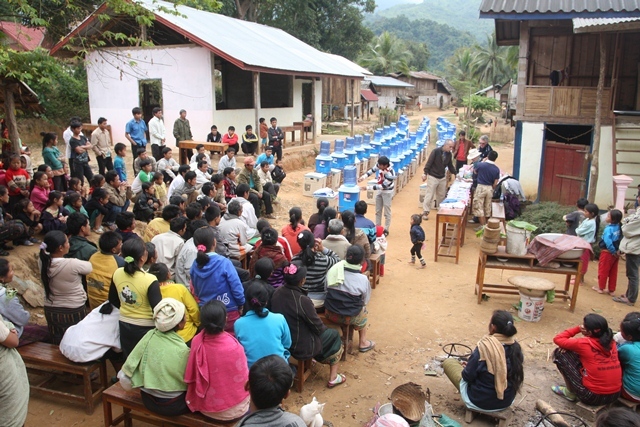 First thing in the morning we headed to the village of Sup Khong to roll-out enough water filters for the entire village of 68 families. I really respect this village too. 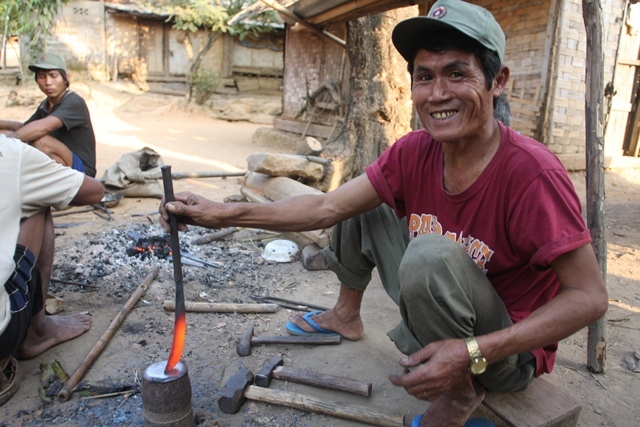 After visiting many villages there are a number of them that stand out from the rest. They are hard workers, yet gentle and they get along really well with each other. Others do not and often spend more time trying to figure out how to coerce and conive against the sponsors – yes, they tend to shoot themselves in the foot. 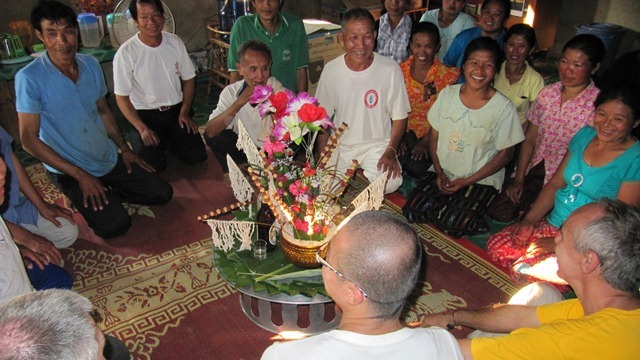 Anyway, here are some of the highlites from thishighly respected village. There were a lot of wonderful volunteers to help us so it didn’t take long to set up. 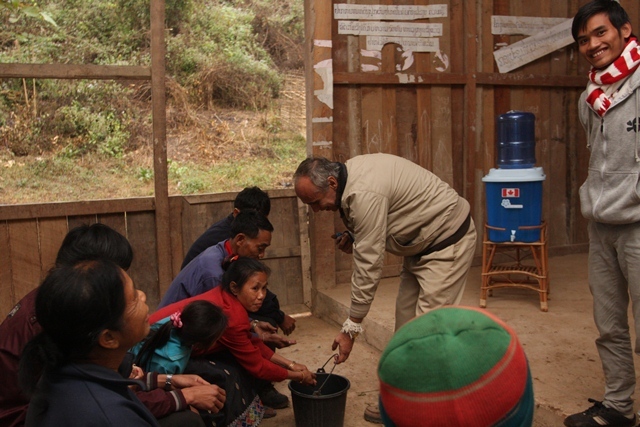 We are just about to start our hygiene training as the last of the water filter systems are set up. 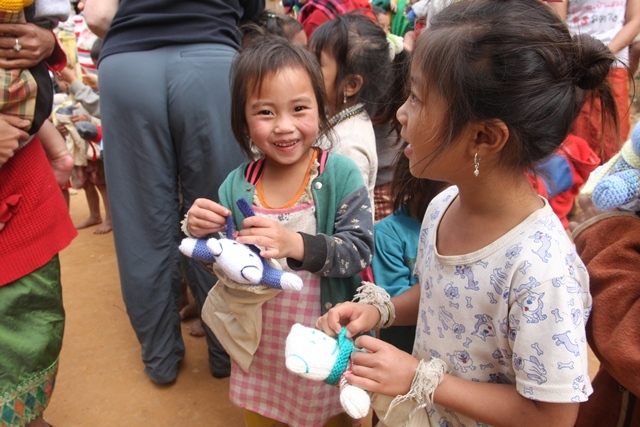 Toothbrushes, toothpaste, dental floss and toys…check! I was surprised how the villagers really seemed to understand. We had fun with it too. Yep! He got to pick out his brand new sportshirt, courtesy of Terri-Jo and Steve Facey in Port Hope. 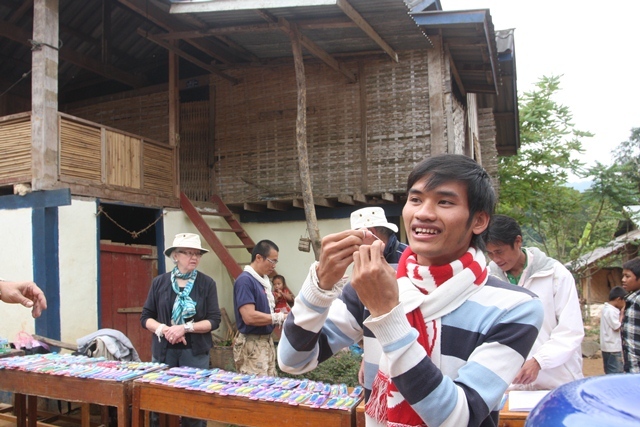 Siphan demonstrates the use of floss – villagers were intriqued and couldn’t wait to try it. If you have ever tasted Newfie screech, this whiskey is a powerful jolt that would certainly compare. Linda and Hugh kicked up a storm, then joined a younger generation and kicked up a storm there too! As we left this village, we noticed that there was some business being conducted. We took a closer look and were reminded of one of the reasons we were there. 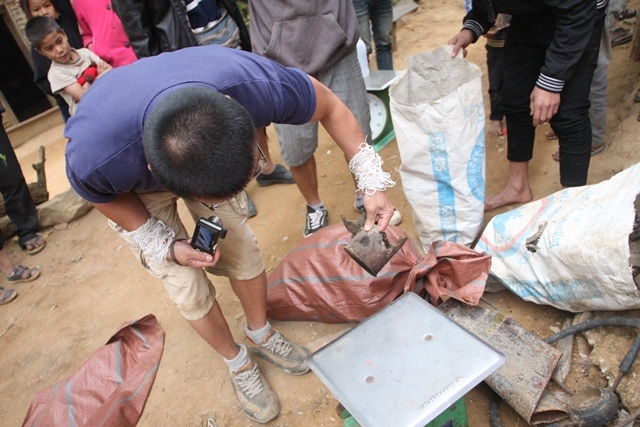 Villagers often finnd bomb fragments in the jungle and bring back the metal for resale….a very dangerous practice. It was a pretty quick reality check for us. It has been a very busy couple of weeks but am so proud and happy to have been visited by great friends and to involve them directly in our projects. Imagination is one thing – seeing is another. Karen Longwell is a photojournalist and I am just so amazed at her abilities to capture the perfect moments. I am going to have to break this posting into a number of smaller ones – there are just so many wonderful pictures. 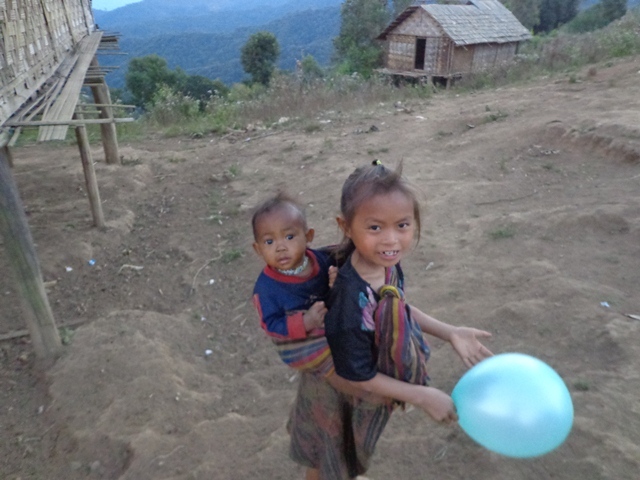 We will start with day 1 of their first village trip. 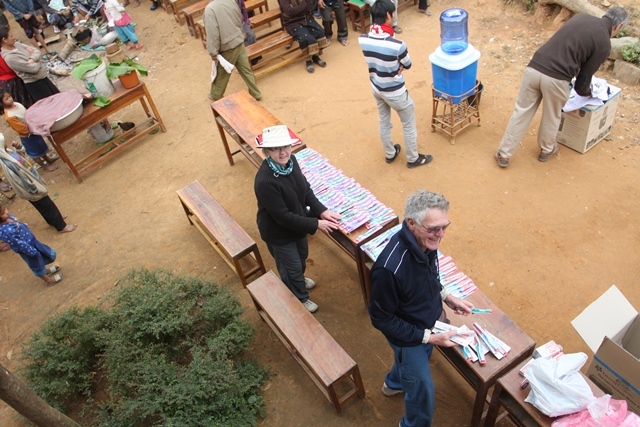 Hugh, Linda, Mike and I are loading the three trucks, getting ready for a big trip. Karen Longwell helped too – in addition to taking this picture. 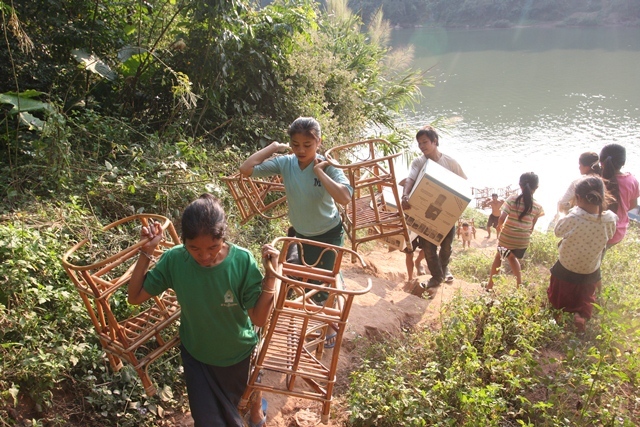 First stop was to unload 25 water filter systems – notice the dedication by our wonderful volunteers! Photo by Karen Longwell who helped as well. 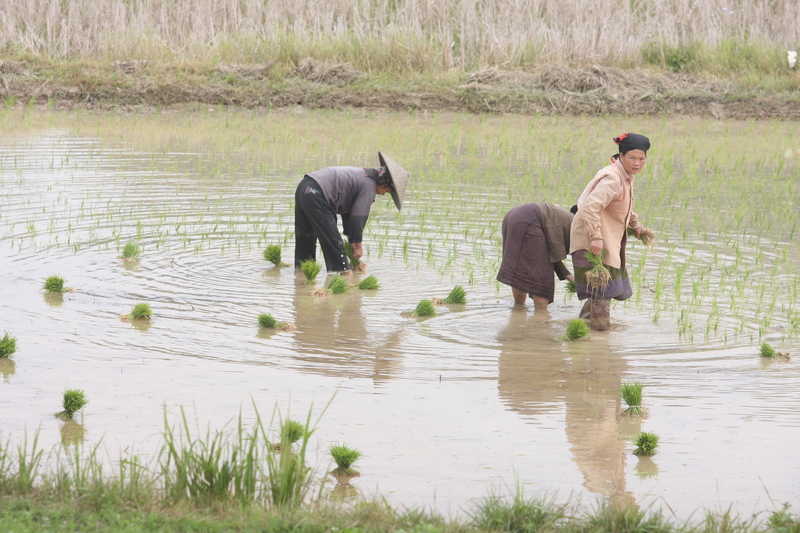 As we were driving to Nong Khiaw,planting rice was in full swing – Karen, you really know how to capture the moments. 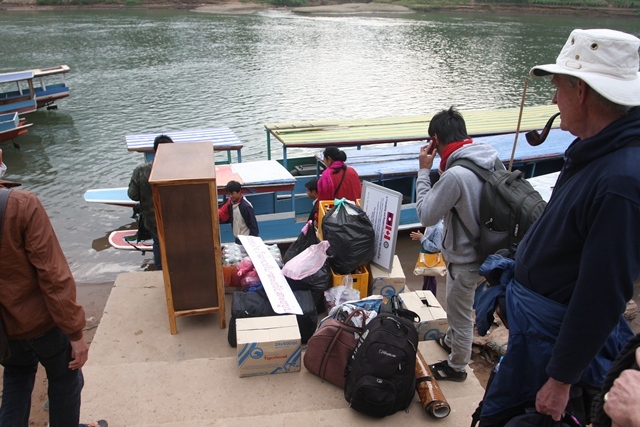 We loaded two boats and delivered to a village that has been asking for water filters for over two years. We are still 455 units behind in our targets. photo by Karen Longwell. This little guy was so eager to help! 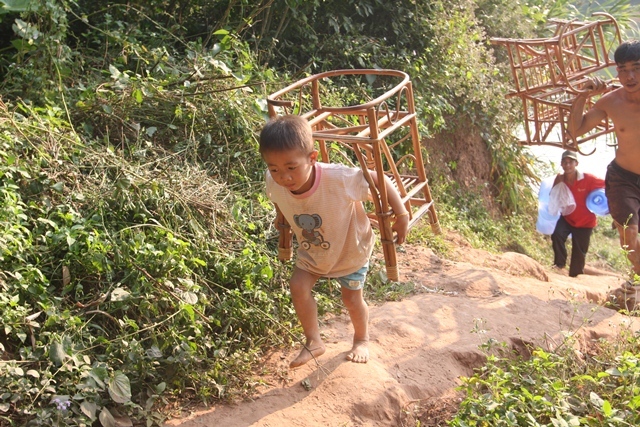 He just grabbed a stand and ran up the bank faster than any of us could climb…without carrying anything. Nobody pushed him into helping either – he just had to get involved. Photo courtesy of Karen Longwell. 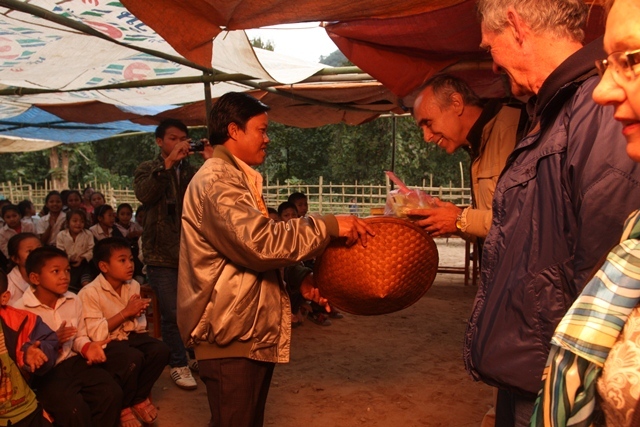 Needless to say I suppose that the two chiefs were thrilled to receive water filters for the entire village. Our resting place for the night and the last tourist outpost to get a decent meal. I have been here dozens of times but Karen managed to capture this majestic view. 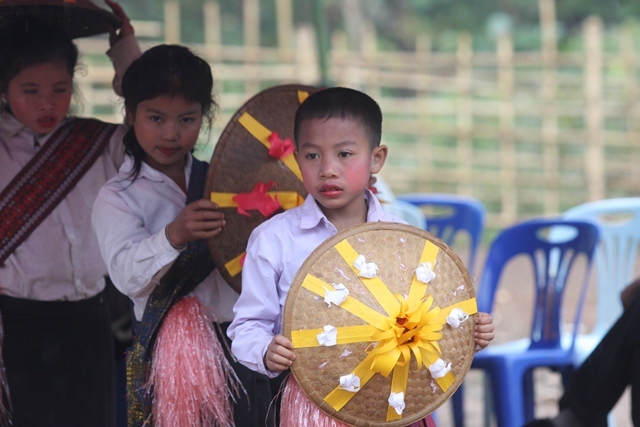 The Governor led the way to celebrate theofficial opening of Hat Kham School. 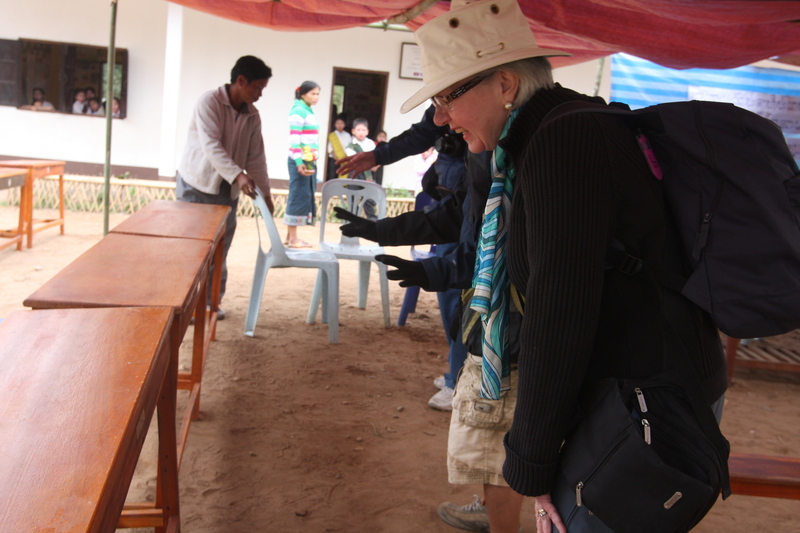 Linda inspects one of the nameplates with their childrens names on one of the new tables that she and Hugh sponsored for the kids at Hat Kham school. Yes, it brought tears of happiness. Ready and waiting. These kids had exams coming up the next day too! Hugh trys his hand at Patong while waiting for my boat to arrive – we were supposed to get there BEFORE the governor but there were just too many stops along the way. They sure went to a lot of work to show their respect for our support. 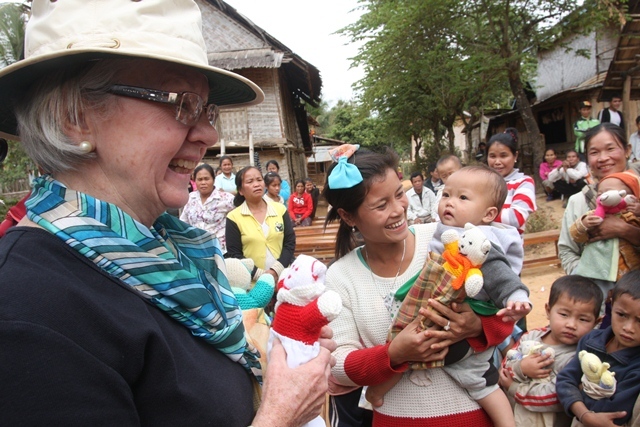 We were all provided with a hand made Lao shirt that included stitching saying ‘from Hat Kham Village’ in English! Our camera people behind the scenes – Karen of course is taking pictures of them! 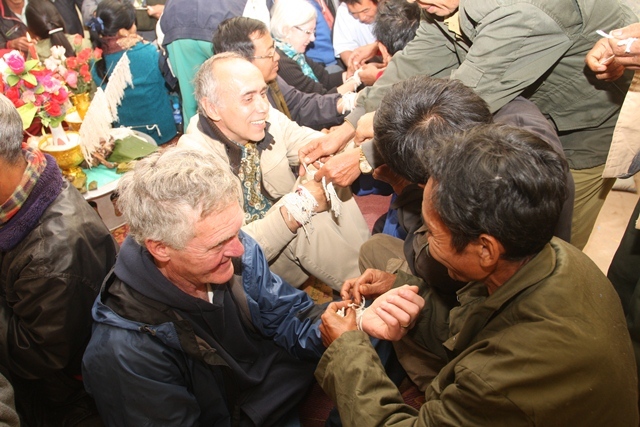 Baci is very spiritual and performed in our honour, although part of the ceremony is a bit wild with so many people trying to put cotton strings (along with prayers) on our wrists at the same time. Part 2 of this update will follow soon. I didn’t realize just how far behind I was with my updates. Once I looked through several file folders of pictures, I understood why I always seemed to be busy. 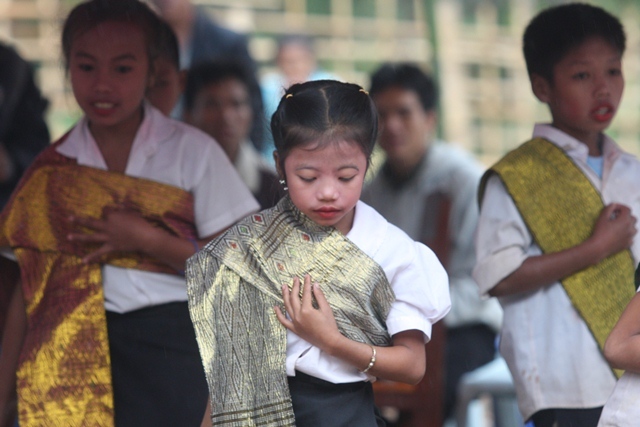 First, here is a picture of the second student we are sponsoring thanks to our generous sponsors. I would like him to thank the sponsors personally and he will but he has only gone through his first semester in a 5 year English course. So I will be patient until he is a bit more confident with his writing skills. 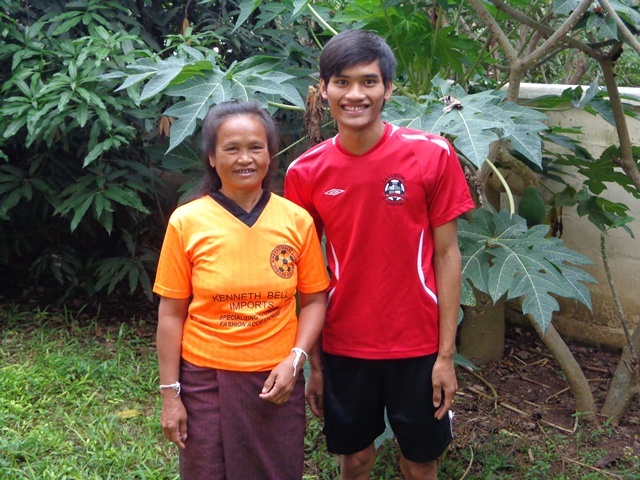 Last year we provided him with a dictionary, and a little extra cash to help him through his last year of secondary school. 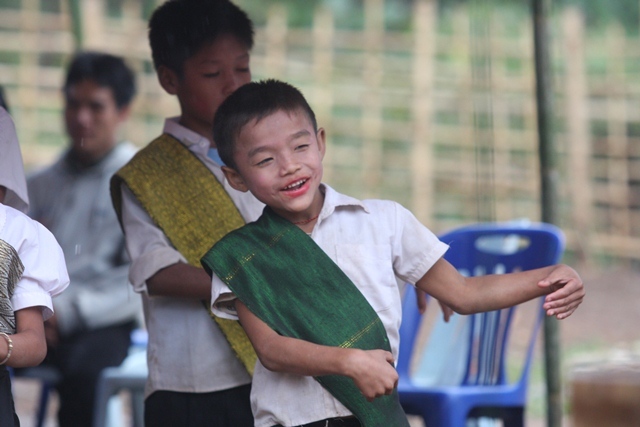 His father suffered a stroke during his last year of teaching so it has been difficult for the family. 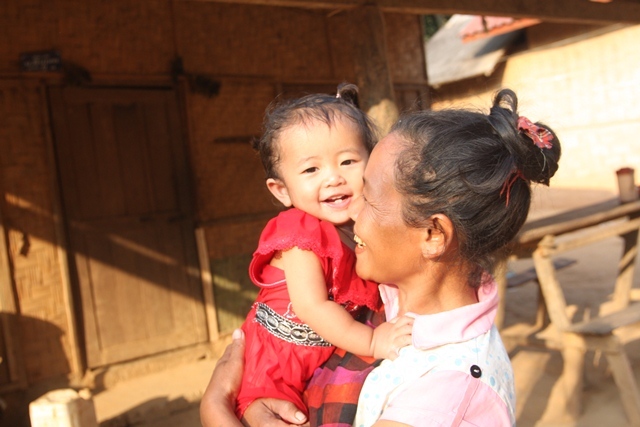 As part of our ongoing efforts to teach hygiene to the families of whom we distribute water filter systems to, and to help some of the poorer families, we have been really fortunate to receive donations of clothing that is light enough to take with us in our suitcases. 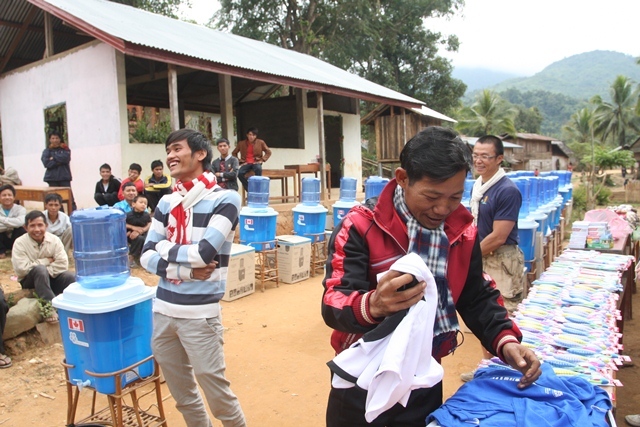 In reference to the water filter systems, it is critical that the villagers listen to the entire course so we advise them that there will be a test at the end, and the winner will receive a jersey if they answer our questions directly. Steve and Teri-Jo Ashton from G.Facey on Walton Street were so kind in offering us sport jerseys that were left over from the various leagues and tournaments from the summer. They are fantastic and so are the jerseys because they are easy to wash and no ironing needed! Mother and Son. I had thought that some of the jerseys might be too small but nope. These are perfect for the adults too! I need to make a point to take more pictures of the jersey recipients. 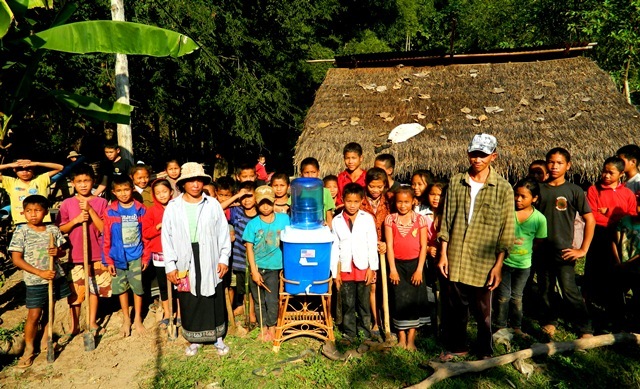 We completed our first distribution of water filters for the season, just in time for Christmas, as we had 97 orders. 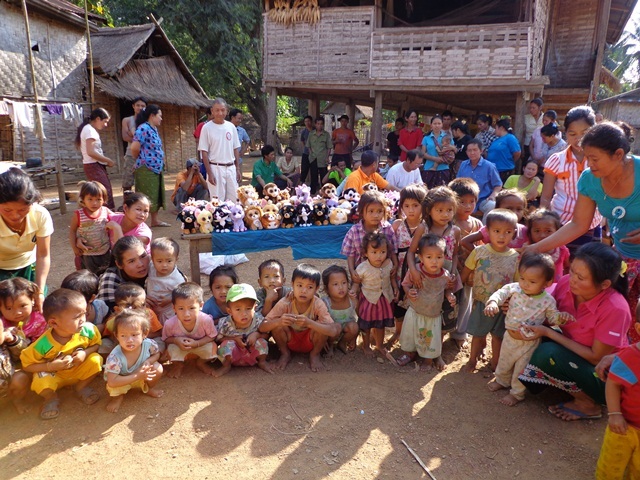 This distribution was done so those who donated could give pictures of the receiving families in lieu of Christmas gifts – there sure is a huge demand for these now. 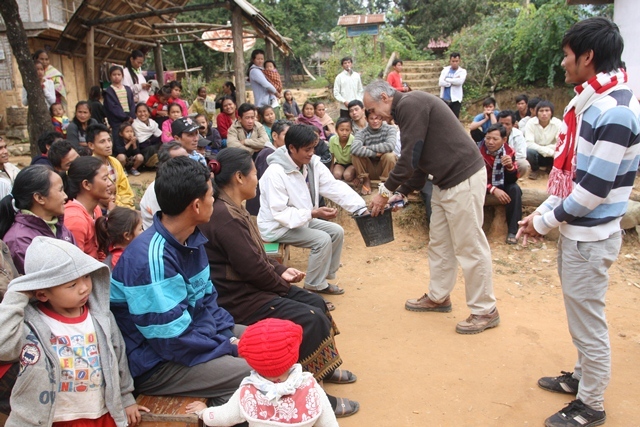 There are so many people getting sick from the boiled water they drink so the demand in these rural villages are greater than ever. 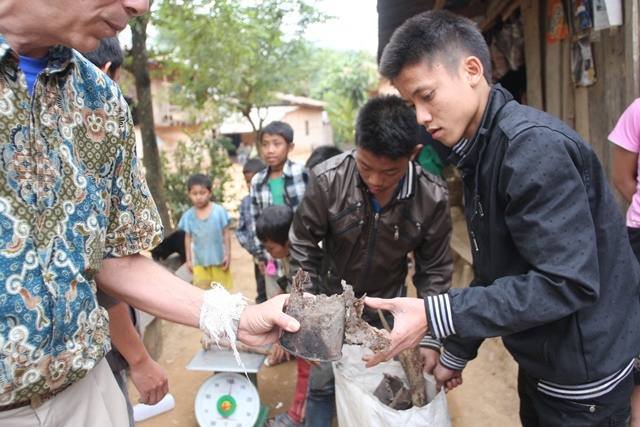 In fact we had to reduce the number of filters to be distributed to a couple of the villages. 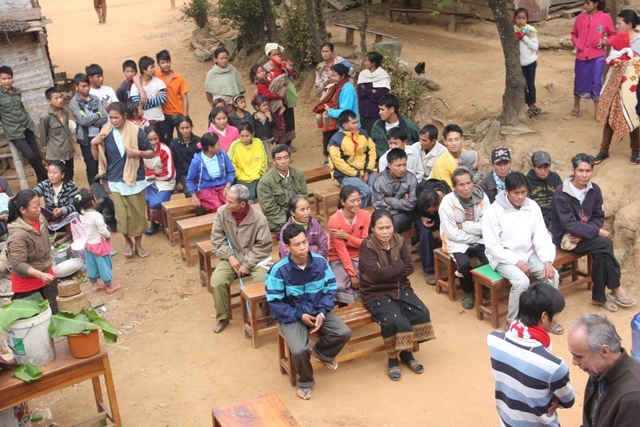 We still need another 70 for one village and about another 90 for another village. 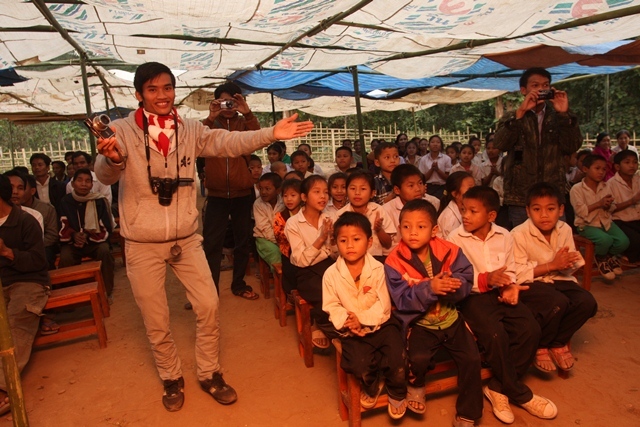 In this picture, we did the distribution during the day so the students were not available for the pictures. 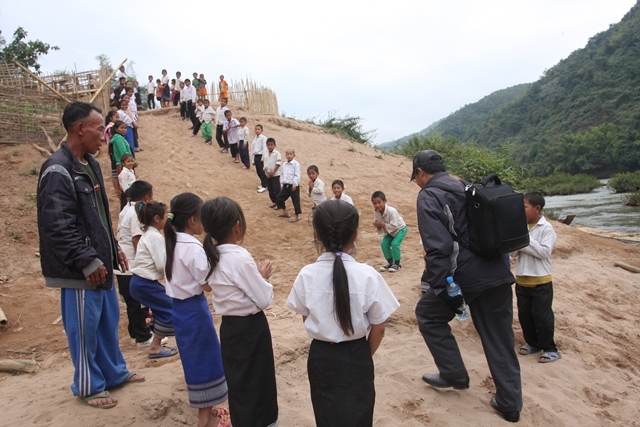 There were two reserved for the school so as we approached, the kids were working under the supervision of their teacher to build a trench leading to the school. 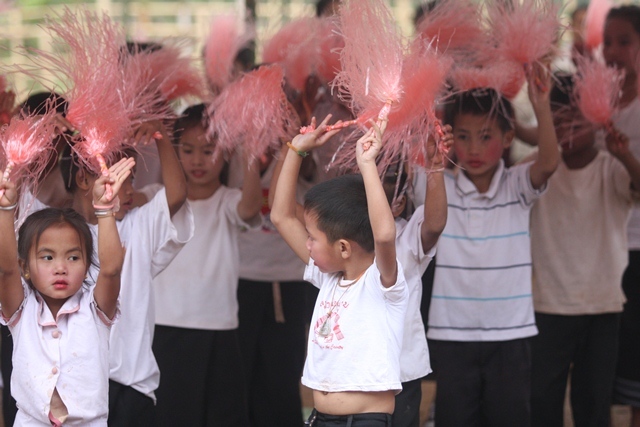 School isn’t ALL about classroom training! Here are the kids! We wondered where they were when we didn’t see any around for pictures. 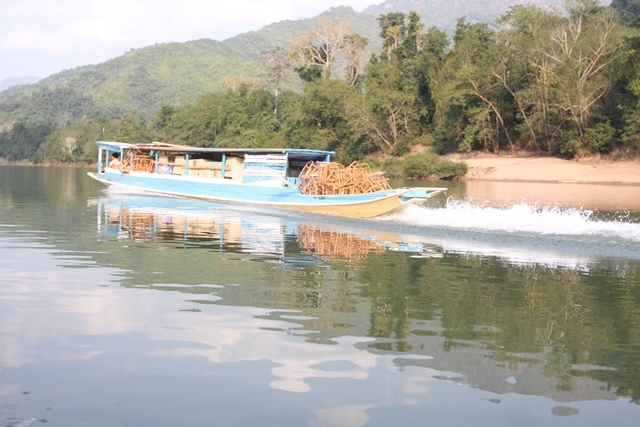 We revisited Ban Na Lea to see if I could get a good internet connection. 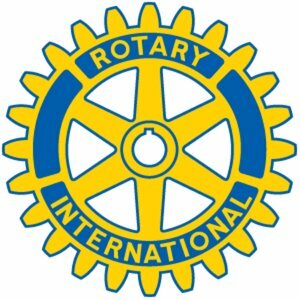 Ideally it would be great to do a live broadcast from the village itself to the great folks of Toronto and area for a fundraiser hosted by the Rotary Club of Toronto Twilight on February 22, 2013. We had hoped to be there for about 20 minutes but that wasn’t to be. 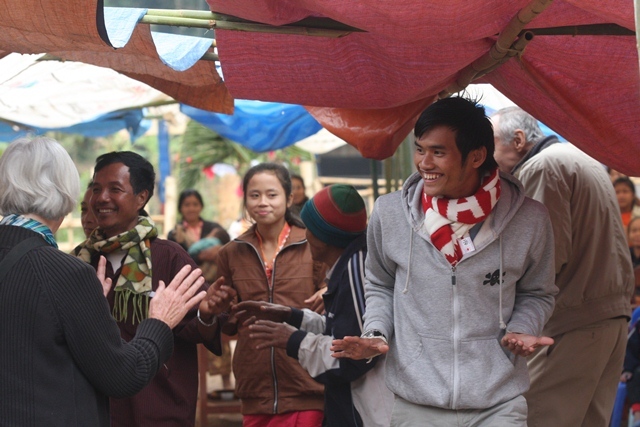 The villagers were so proud to see us again that we couldn’t just leave. They slaughtered a duck, went through 1 1/2 bottles of Lao Lao with flavored herbs (helps make it go down easier) and lots of conversation and fun. This should have been included in my last post but it just shows you the welcome matt they provide to us. 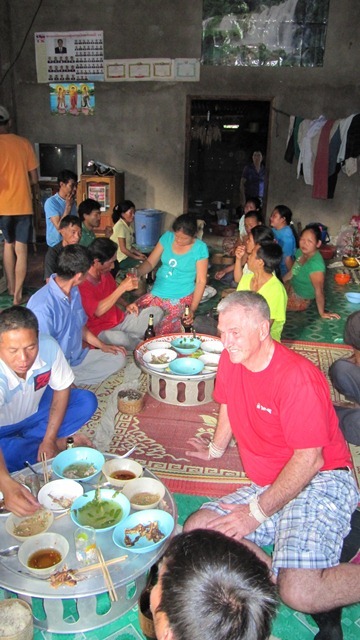 Art Quickenton, front and centre enjoys some of the local food after baci…well sortuh. 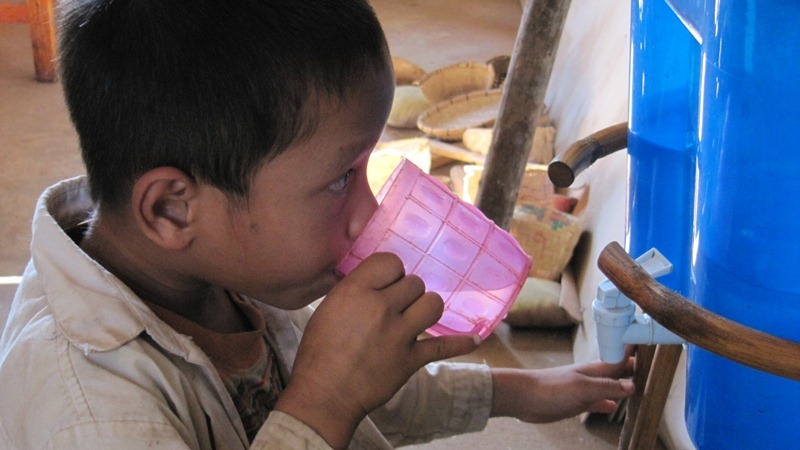 It was also wonderful to see the kids drinking the water from the water filtration units. 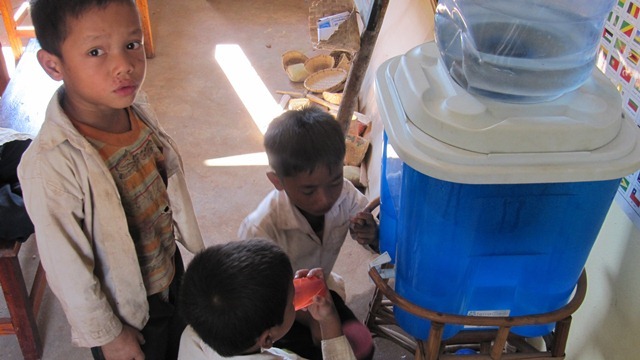 It is always so fulfilling to see the filtration units in action as the kids enjoy filtered water. All of our efforts are rewarded when we see images like these. In the end, two of us managed to get away from the group to test the communications. We tried everything. Apparently the area is expecting 3G but it isn’t there yet. Instead they have a previous version called E. It is only good for simple and short voice communications. It was indeed disappointing news. 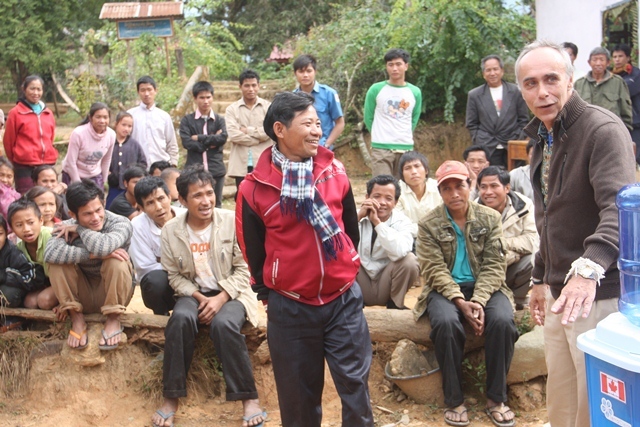 Instead I will be preparing a video of the village and while I will do a live broadcast, it won’t be from the village. I also got a good look at their water supply. It dries up from late April through June or early July. They think they have a solution but I asked them to go through their hygiene (water) department and then send us a written request signed by the Department. 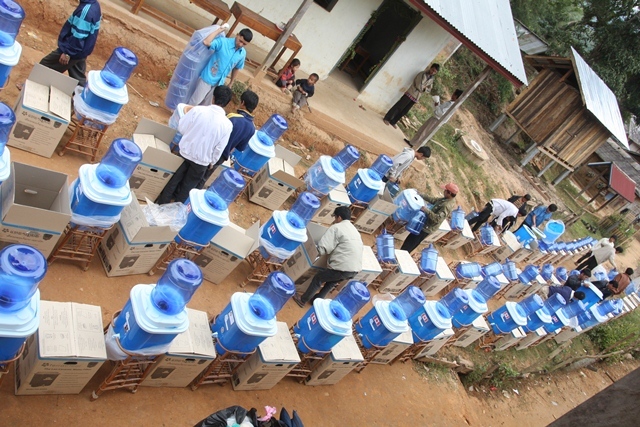 While we were distributing water filters, of course we provided a lot more. 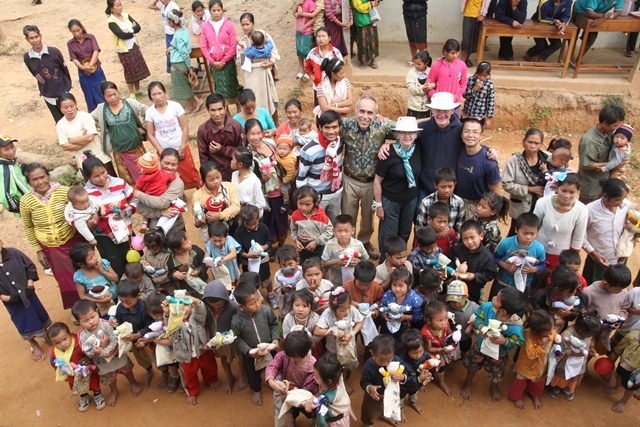 Mike’s friend from Toronto, Mike Ecclestone, received a donation for us of about 40kg’s of beanie babies. Needless to say Mike could bring very few clothes with him since 44kg is the max without additional baggage charges. I wonder who is having more fun! 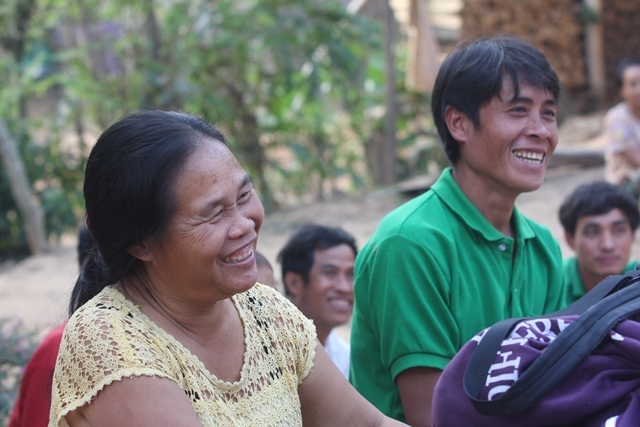 It is so difficult to get villagers to smile for a photo but before and after is a very different story. With each water filter we provided toothbrushes, toothpaste and dental floss, thanks to Dr, Anna Tucka and Altima Dental from Port Hope. Yes, the families share toothbrushes – usually there is one per family, now there is at least two! 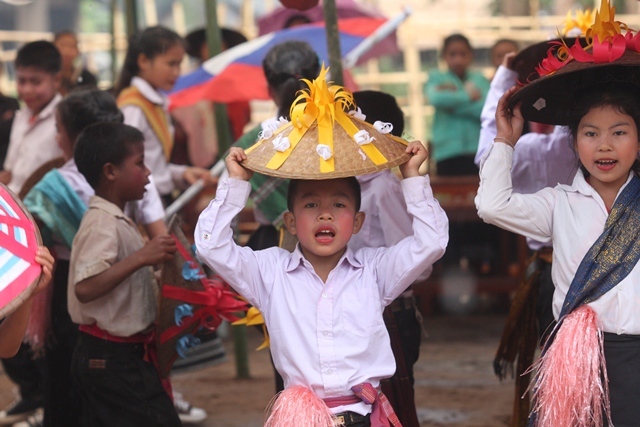 We also made a return to Hat Kham Village. One caring couple decided they wanted to donate additional desks to the school because we were 15 short due to a budget shortfall. 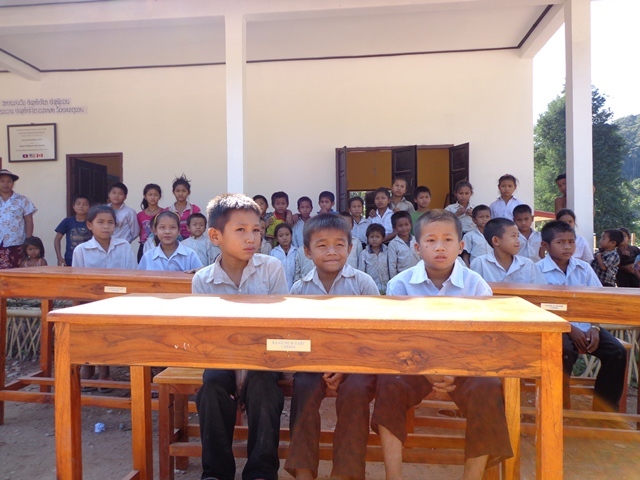 The desks were provided to the students of Hat Kham in lieu of Christmas gifts for Hugh and Linda’s sons and daughters. We mounted nameplates in each desk but because they were done in brushed aluminum, we could not get a decent picture until we rubbed blue chalk into the grooves. It worked! We were able to enhance the images enough to get some decent pictures. The school kids really had no idea why they were needed for picture taking, especially on a Saturday! All was forgotten once the bags of candy were brought out. We have also been working on a number of other projects to get through the usual red tape that we all go through in our respective countries. 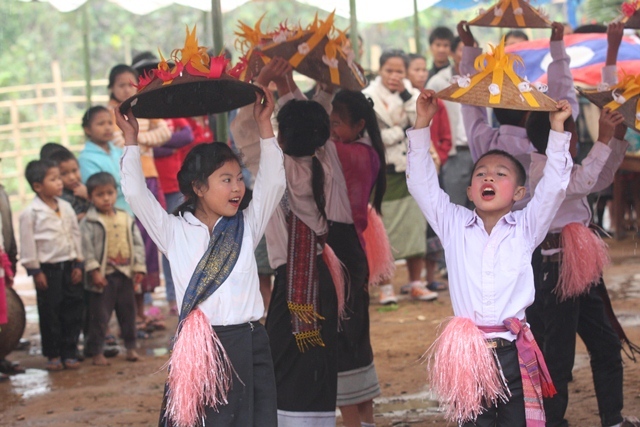 I am pleased to announce that just yesterday, was the official start of Phase 2 of the Nong Boakham Secondary School. They estimate that it will take 70 days to complete two additional classrooms and separate boys and girls latrines with running water. 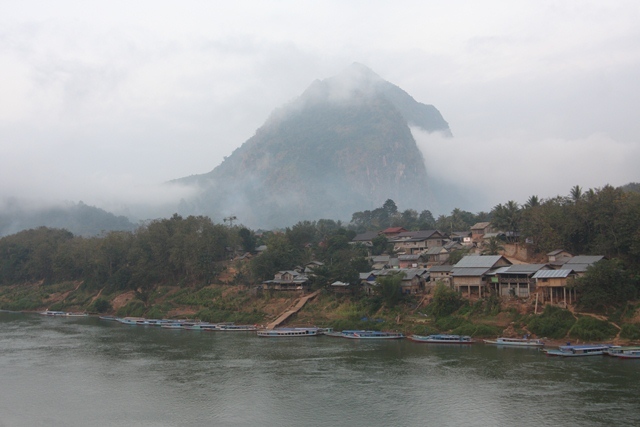 I have not been there since I returned to Laos but will do so once our next visitors arrive on a few days. 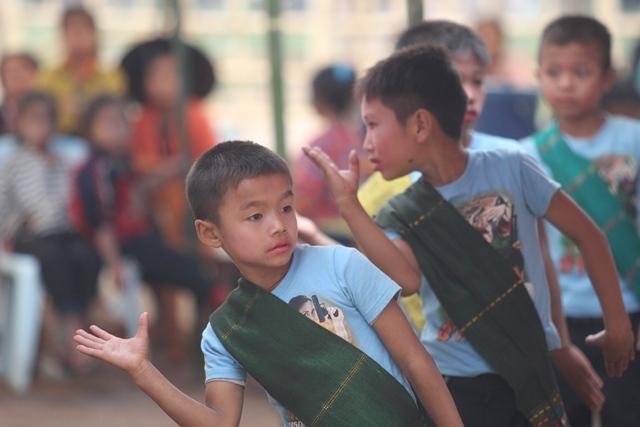 I have also been going through the normal hoops to try to get the Phase 2 Meung Luang Hospital Upgrades started. I think we are still a couple of weeks away from that. It appears that the formal request was not properly authorized by the Government – the hospital skipped as step. The Government has approved the new roof but we are still looking at the other items. They would prefer to tile only the patient rooms, skip the special garbage bin and use the remaining funds for stethoscopes, a blood pressure unit and a sterilization unit. Once I have the exact costs of the changes I will go back to our sponsor to seek approval of the changes. The last project that I still need to start is a continuation of the Pha Yong Toilet project. I was hoping to build at least 3 units but we are still $1600 short of our targets. This may result in a reduction of the number of toilet banks we wish to build this year. 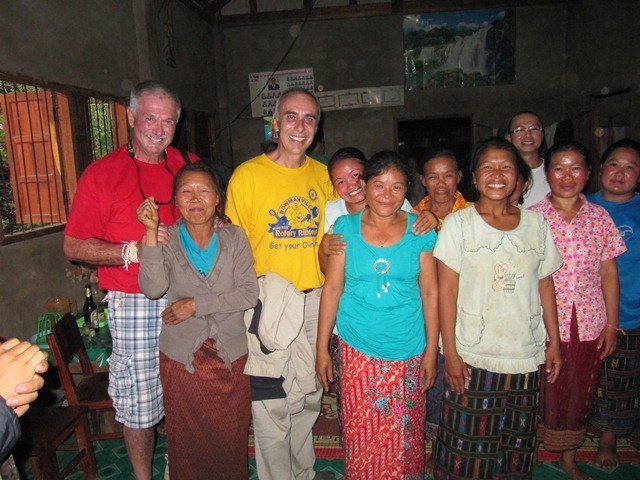 I am also awaiting matching grant funding from the Rotary District 7070 but hopefully that will be coming soon. So I will hold off on that until I hear more or some magic, generous donor pops out of mid air. I am always behind the 8 ball these days – partly due to the poor internet service I have here, partly because I always seem to be busy (which is a good thing) and partly sheer procrastination…. Art Quickenton, a good friend of Mike and myself, just left a couple of days ago after spending three weeks with us. 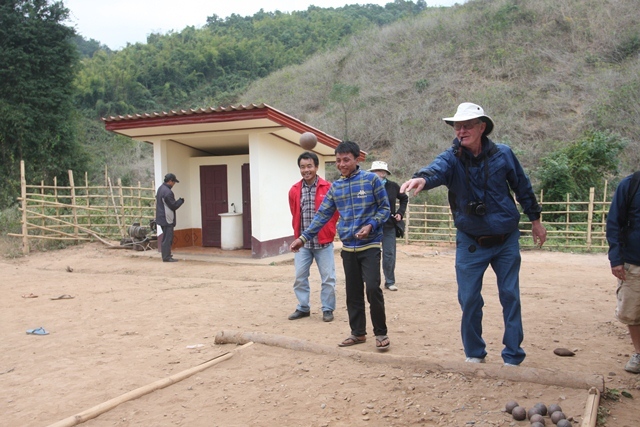 A good part of his mission was to select a location to build a new school, with the help of students and faculty at Appalachian University in Boone, North Carolina. There were three good options that were selected to review however as it turned out one of them was not so good afterall. 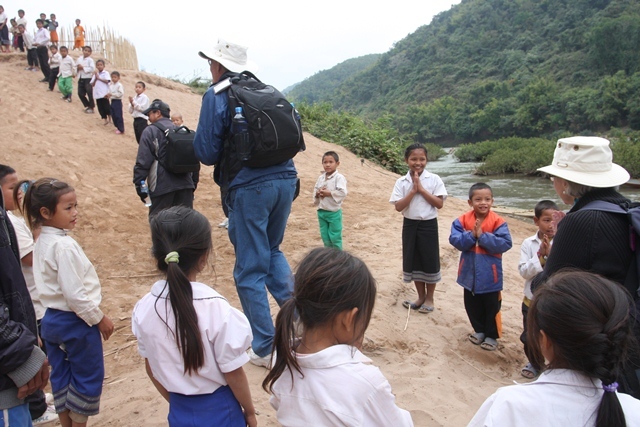 The trek to the village would have been 5 hours each way (not including the minivan and boat trip) so I cancelled the visit there – the costs would have been just too high to ship materials there and it is very tough to raise money for schools back at home for schools. 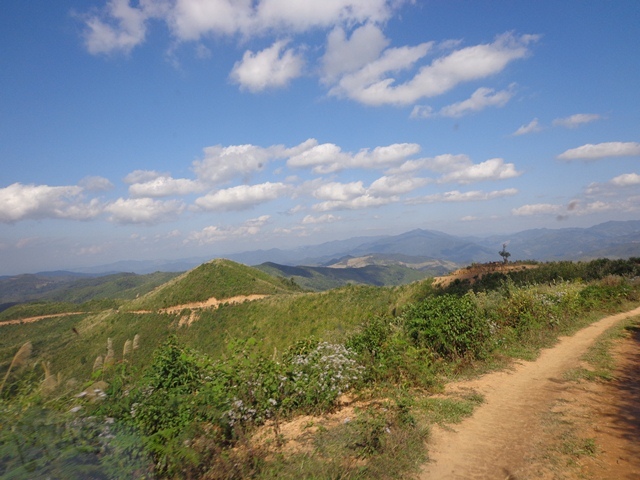 So we looked at Ban Phone Kham and Ban Katang Xieng Village. The choice was clear from the moment we saw the village. This village has no water and the villagers need to trek to get it with buckets or bottles in hand. 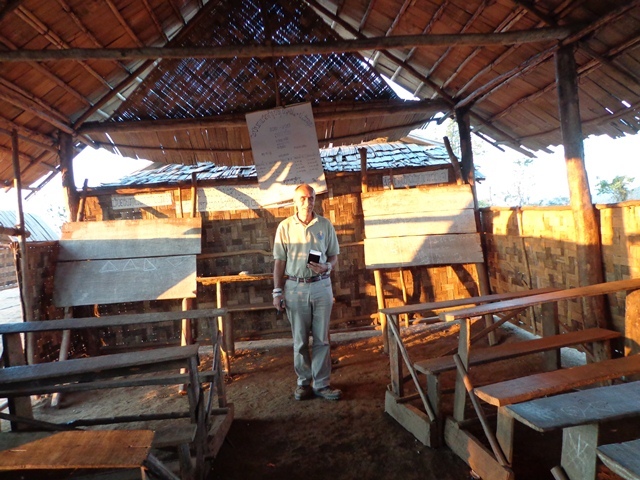 There was no electricity, no toilets of course and the school basically (very basic) consisted of two shacks that do not look like they are going to make it past the next monsoon season. 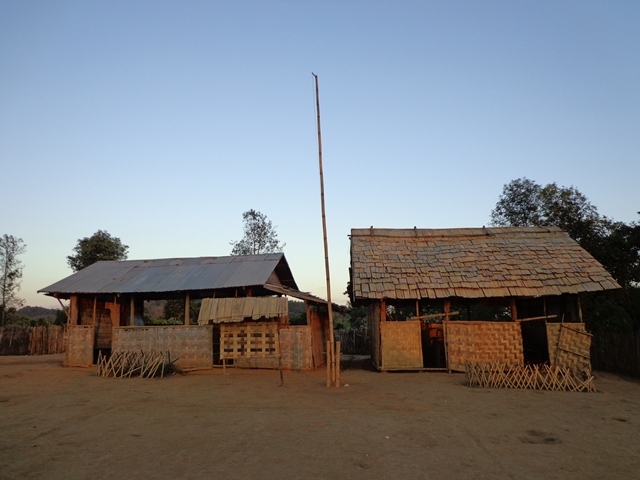 All of the huts were approximately the same size (my best guess is 10′ x 12′) and all made of bamboo including the roofs – not a single tile roof in the village which was a first for us to see. Finally, this was the village that had the highest number of kids running around without clothes. I am making the assumption that water to wash clothes is difficult to get. Take a look. Nestled on a mountain top at the end of a newly finished road. I can only imagine building my house here, except with no water or electricity. 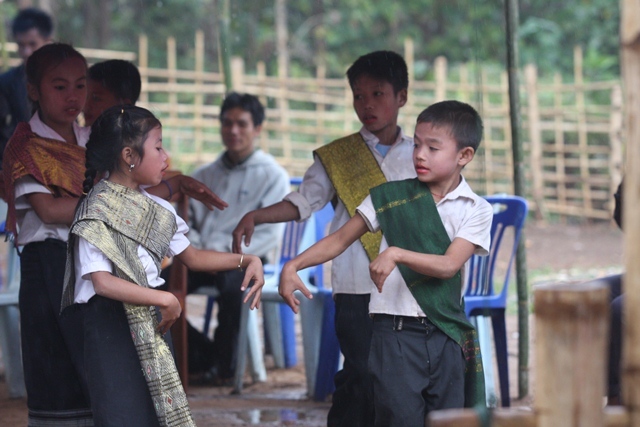 With all the comforts of school at home…NOT! Nice Blackboards! 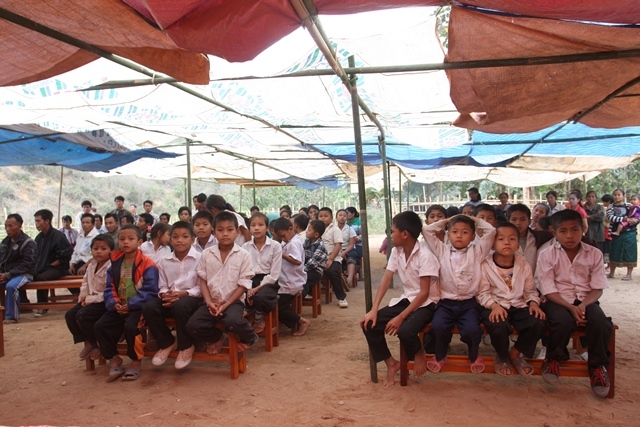 With only 2 makeshift classrooms, they teach Primary school 1-5. 66 students in total with 25 new students coming in next year. 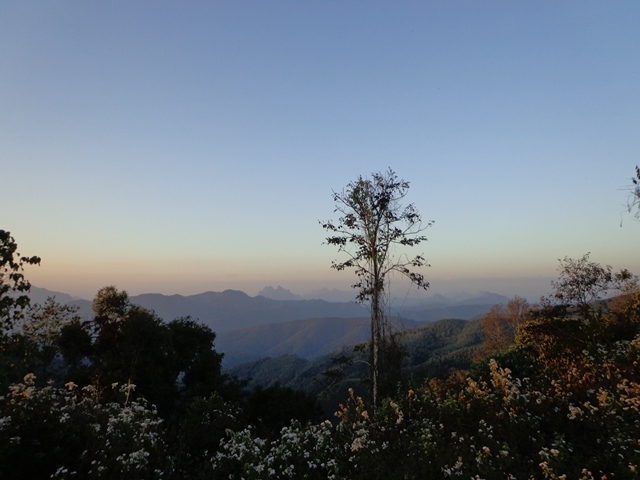 I wish we could have stayed longer but the sun had just set as we arrived and the mountain road was dangerous at night. 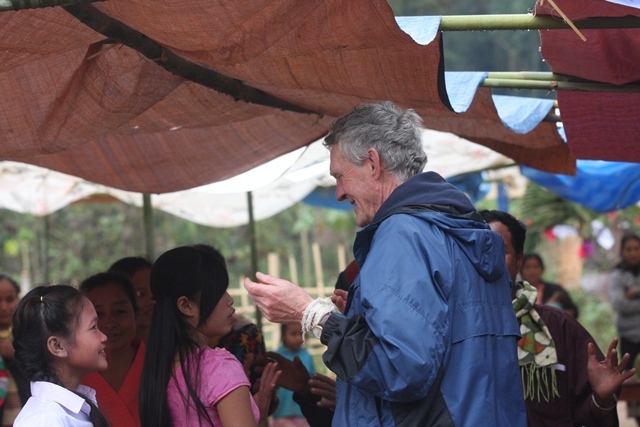 Siphan and I were running around to meet with the chief – I wish I had time to get more pictures, especially of the kids – no foreigner had been there before offering assistance so I think we made their day. 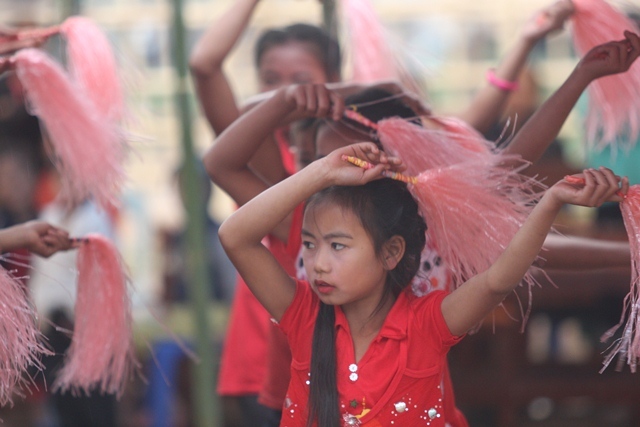 The village was 100% Khmu and we couldn’t help but feel for their struggles. 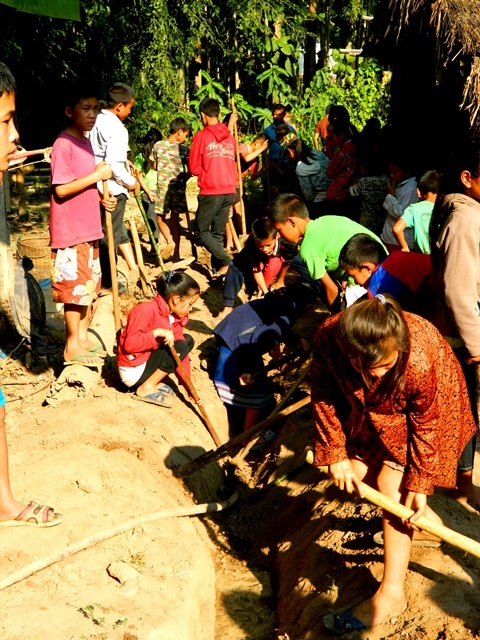 They had visited the officials in Nong Khiaw a number of times to try to get water to their village but so far there has just been one delay after another. I am hoping that our offer to help will help push the hygiene office into engineering a solution for us. Meanwhile, Art will be doing a number of fundraisers in Boone to raise funds to build a real school. 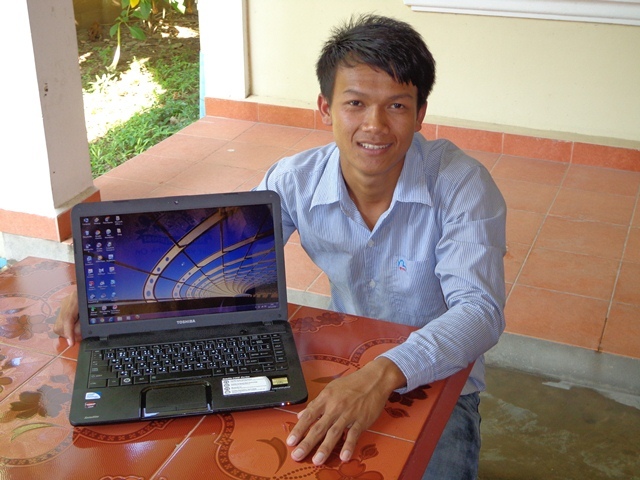 We certainly wish Art the best of luck in his endeavors…Thank You Art for your visit and for caring.